Discussion about the Fam, The Silver Wing series. 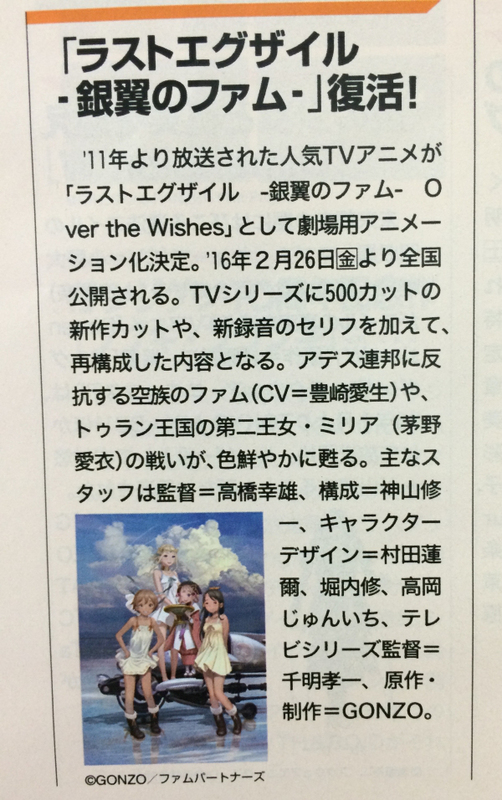 According to Eirin's website there is a 1hr, 59 minute "movie" coming out titled Over the Wishes. The summary roughly says something about Fam and the sky pirates as well as Millia princess of Turan whose home country was devastated and led the fight against the Ades Federation aim for the founding of a new Turan kingdom. No confirmation yet as to whether or not this "movie" is new content or one of those condensed omnibuses and all reports from people seem to be scattered, but there is apparently a thing and this thing has a new title regardless. So we'll probably learn more one way or the other soon enough! That is interesting. Even if it is a series remake kinda thing they usually add new material to those right? If it's an omnibus then, like the BD's, there might be some animation upgrades for certain scenes. Not sure how voicing for little new things would go though if it's possible at all to get the VA's in. Assuming there'd be anything new for an omnibus. I hope we get more info soon! I want to know if I should be SUPER HYPE for new canon or just generally a little hype for the potential of something like upgraded animation for an omnibus. Tara wrote: If it's an omnibus then, like the BD's, there might be some animation upgrades for certain scenes. Not sure how voicing for little new things would go though if it's possible at all to get the VA's in. Assuming there'd be anything new for an omnibus. I hope we get more info soon! I want to know if I should be SUPER HYPE for new canon or just generally a little hype for the potential of something like upgraded animation for an omnibus. Do anime companies usually have problems with getting VAs to come back for things? from what I've seen they usually have better luck at than even Disney does. I'm kinda excited no matter what it is, but also anxious because this is a series that really enjoys crushing my heart. Murata-sensei hasn't lost his touch! Also, some more information has come out, including an exciting new trailer! I haven't spotted any major differences, but it did come out four years ago and my memory's never been great, so that's not saying too much. Time for a rewatch! It'll premiere in ten cinemas throughout Japan on February 6th next year, and will stay on screens for two weeks. Tickets, however, go on sale on November 21st this year for some bizarre reason; the goodies-inclusive ones are going for ￥1,500 and will come with a B2 poster of that promotional illustration. The price for the regular tickets hasn't been listed yet, and will probably vary according to the cinema. Definitely agreed! Dio was criminally underused in Fam, I'd love to see more of him in the film! I'm also curious about how much they're going to change apart from the animation touch-ups and new scenes and dialogue - the Madoka Magica omnibus films switched around the BGM for some scenes and even added some new tracks, which could freshen things up a bit. Anime News Network wrote: The film will recompile the original television series with about 100 shots of newly animated shots. It will also have reshot footage, and some of the dialogue is being recorded again. Bit confused as it mentions reshot footage, which doesn't seem to be mentioned anywhere in the source, and also the '100 newly animated cuts' seems to contradict the '500 new cuts' mentioned in the article Tara posted? I'm also unclear as to whether some of the dialogue is being re-recorded or whether new dialogue is being added... 新録音のセリフ and セリフも一部新録する could both mean either, but I suspect that the first option will end up being true. Oh gosh WHAT A NICE PICTURE I'm so glad there's a better quality version of it. Gonna be really tempted to buy that poster if one goes up for sale. As for newly animated vs reshot, I think the difference there is newly animated might be brand new scenes whereas reshot are scenes that are touched up/reanimated existing scenes (like some of the BD shots were). So maybe there will be 500? a IE, roughly 100+ brand new, the rest reanimated scenes. MAYBE. Either way aaaAAAAaaah so excited!! 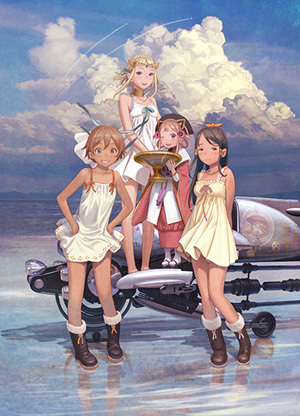 So at least something new is coming out in the last exile universe… well, not so new though. Now I am curious to see how they will manage to shrink 21 episodes into a 2 hours movie. In particular I wonder if it will just be a “Ginyoku no Fam” abridged version but with improved animation and cool dialogues or if they will also change the story a bit, just like they did for the manga and the novels. Aki wrote: I haven't spotted any major differences, but it did come out four years ago and my memory's never been great, so that's not saying too much. Time for a rewatch! Well, after watching the trailer it seems like this time we will witness the full exile vs exile battle that obliterated Glacies. It probably will be. They may add a couple of things but it doesn't seem like they'll have too much leeway to change anything up too big story-wise, unless it's to elaborate more on something already there. They'd need a new canon thing for that, like an actual movie. Still, a little elaboration on something would be awesome. I'M SO GLAD FOR THIS. I remember-- actually, before the BD came out with that extra scene in the credits of the Exile ending it, the scene was in the official karaoke video (because I remember watching that and being like OH THAT'S... A NEW SCENE). But all the same, that one little scene was still like, man that's still not much! So I hope we see a little more there. Hahaha, that's pretty funny/sad, first seeing a new scene in the karaoke video! But yes, it'd be nice to see some more stuff... Anything new (and not just reanimated) would be appreciated! Though reanimated stuff is good too, of course.